Robowatch Technologies and Diehl BGT Defence will announce the global launch of their modular reconnaissance and defusing robot ASENDRO on 11 April 2006. 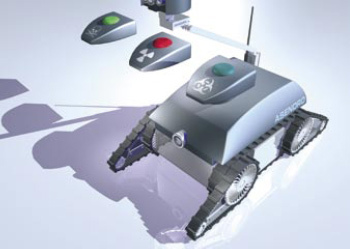 The robot is capable of detecting persons and weapons, climbing stairs and reaching every nook and cranny. With its gripper arm it can examine suspicious objects and defuse them. Its small size, relatively high speed and modular design makes ASENDRO for operations inside buildings and public transport.